As an executive charged with leading a sales team, you know that two keystones to making your numbers are 1) the effectiveness of your execution and 2) the mindset of your people. Countless articles and MBA case studies have been dedicated to the execution side of the coin. But the people component often goes uncovered. We're here to remind you: you cannot hit your numbers managing process and tools alone. 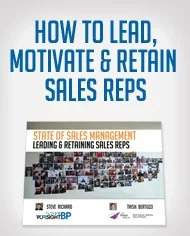 In this ebook, we identify 4 pillars for motivating and retaining sales reps. The Bridge Group and VorsightBP surveyed 2000+ sales executives – individual contributors, front-line managers, and directors. This ebook is based on that research.